If you have received an email from us with an offer of admission, welcome to the McGill BCL/LLB program! You are among a select group of students with a variety of career aspirations, backgrounds, and life experiences who have demonstrated great intellectual curiosity, community engagement, leadership, interpersonal skills, openness, maturity, ethical sense, judgment, and potential for development. Your future professors and your fellow upper-year students look forward to meeting you. Students admitted for September 2019: the orientation and registration package will be available on the Faculty of Law's Student Affairs website at the beginning of July 2019. Welcome Day and mandatory in-person registration take place on 26 August 2019. Your formal letter of admission is available on Minerva. You must print this letter for your records, as the Faculty of Law no longer sends admissions documents by mail. If you are an international student, you must print additional copies which you will need for your immigration procedures. In the admissions email which you have received from us, there will be a list of Student Ambassadors. Feel free to contact them if you have any questions about the program or student life. You may wish to hear more about the doors that the BCL/LLB program will open for you after graduation. If you are interested in speaking to a McGill Law Alumnus please contact the Admissions Office and we will connect you with someone who would be more than happy to answer any questions you may have about their experiences at McGill, as well as the various careers and opportunities that lie ahead for McGill Law grads. The Faculty of Law offers a number of entrance scholarships based on both merit and financial need. All admitted applicants in the University, Mature, and Transfer categories are automatically considered for Faculty of Law scholarships: there is no need to apply for these. Admitted CEGEP candidates are eligible to apply for McGill University Entrance Scholarships. See the ‘Financial support’ section of the Tuition and Financial Support page. McGill University also offers a need-based Entrance Financial Aid program. This program is offered to students admitted to McGill who are entering the first year of full time BCL/LLB studies. It offers financial aid to students of modest income who require assistance to enable them to attend McGill. Entrance Financial Aid applicants must apply for government student assistance in order to be considered for this need-based program. Newly admitted students should apply within 30 days from the date they were admitted and no later than June 30. The portal for applications for Entrance Financial Aid opens for new students at the beginning of January. To apply, login to Minerva, select the ‘Financial Aid & Awards’ menu and then ‘Financial Aid’. In addition, McGill University offers a program of In-Course Financial Aid to students who are experiencing financial difficulties while they are in full time attendance. The application form on Minerva is available starting August 1. For more information on our financial aid programs, please consult McGill's Scholarships and Student Aid web site. Candidates may be admitted to the BCL/LLB on different conditions. In some cases, candidates may be asked to meet two conditions (completion of their degree program and French language instruction. Please see below for details). Whatever the condition, it must be completed before the end of the registration period (end of August). Candidates may be admitted to the BCL/LLB Program with a condition. In some cases, candidates may be asked to meet 2 conditions – for example, completion of their undergraduate degree program and improving their language proficiency by taking a French language course. Whatever the condition, it must be completed before the end of August and before starting the program. Completion of a Diploma of Collegial Studies (DCS) for CEGEP candidates or completion of the French Baccalaureate, for candidates coming from Marie-de-France and Stanislas. Completion of intensive French language instruction at the High Intermediate level. See the ‘Review French Requirement’ tab below for detailed information. Completion of the undergraduate degree program represented in the admission application. As explained in your letter of admission, in order to secure your admission to our program, you must complete the necessary requirements of the undergraduate degree that you are in the process of completing. A letter from your academic department or a final transcript attesting to such completion is required before you begin the law program. Maintain your current cumulative GPA. Complete the necessary requirements to obtain a graduate degree for candidates registered in a graduate program. As explained in your letter of admission, in order to secure your admission to our program, you must complete the necessary requirements of the graduate degree that you are in the process of completing. The graduate degree could be a master or a doctorate program. successfully completed all internship, essay or other requirements of your program. submit a final transcript indicating the actual date of graduation with your graduate degree. We would accept that these last steps be completed after the end of registration period. A letter from your academic department or a final transcript attesting to program completion is required before you begin the BCL/LLB Program. These guidelines reflect the structure of most graduate programs. It is your responsibility to ensure you fulfill your condition(s) of admission to the Faculty of Law. Why have you been admitted with a condition? Our BCL/LLB Program is a full-time program of study. Due to the demanding nature of first year in particular, the Faculty must be satisfied that you will devote your time to succeeding in our program. The Faculty does not permit students to be registered in our BCL/LLB Program and another university program concurrently. Nor does the Faculty permit students to register in our program on a part-time basis with a view to completing other programs of studies while taking courses in our Faculty. Finally, the Faculty does not permit students to take leave from our program in order to complete a graduate program. What will happen if I am not able to meet this condition? If you are unable to complete the requirements of your graduate program before registration in the BCL/LLB Program, you may choose to withdraw from your graduate program. For the condition of graduate studies completion to be removed, you must demonstrate that you are no longer registered in your graduate program. Please contact the Admissions Office for more information. If your offer letter indicated a condition to complete French language instruction prior to registration in our program, the course must be completed before the end of the registration period (end of August). The course is such that, once successfully completed, you would be eligible to enter into an “advanced-level” French course at the same institution. These guidelines reflect the type of language courses that have satisfied our condition in the past. It is your responsibility to ensure you fulfill your admission condition. Proof of your registration and, subsequently, proof of successful completion are required. Please contact the Admissions Office to ensure the suitability of the French language course you intend to take to meet your condition. To accept our offer of admission, you must open your Minerva account. On the page: “Admission Application and Documentation Status”, select the application and then click on the link which allows you to accept the offer of admission. You must pay a non-refundable deposit of 400$ by credit card. This deposit will be subtracted from your tuition fees when you register in the law program at McGill; or will be forfeited into a financial aid fund if you do not register. If you do not respond to this offer before the deadline indicated in your letter of admission, your place will be offered to another candidate. If you have difficulties connecting to Minerva or you need to reset your password for Minerva, please contact the Minerva helpline at (514) 398-7878. Candidates who are offered admission have a period of six weeks to accept or decline the offer of admission. This delay get shorter as we move closer to the end of the admissions cycle. If you are currently registered in another program at McGill, you may encounter some difficulties accepting our offer on Minerva. These difficulties may occur because the student information system detects a conflict between your current program and the BCL/LLB program to which you have been admitted. If you are enrolled in an undergraduate program at McGill, the conflict may arise because you have not yet declared the date on which you intend to graduate from your current program. Once you declare this date on Minerva, you should then be able to accept our offer of admission on-line. Graduate students at McGill require the approval of Graduate and Post-Doctoral Studies in order to declare the date on which they intend to graduate. If you are currently enrolled in a graduate program at McGill, you must contact your department and obtain the necessary authorization so that you can be registered in two programs at the same time. Do not hesitate to contact The Admissions Office if you have any difficulties accepting our offer of admission. If you have been enrolled as a student at an institution other than McGill University during the 2018-2019 academic year, you must submit a final official university transcript to the Law Admissions Office at the Faculty of Law. In order for transcripts to be considered official, they must be submitted in an envelope sealed by the Office of Registrar of the issuing institution and sent directly to the Admissions Office of the Faculty of Law. The Faculty of Law also accepts official electronic transcripts. For details about submitting official transcripts, please read the ‘Transcripts’ section of the Supporting Documents page. This transcript should include results for any courses taken during the summer prior to starting the program, as well as a notation of any degree awarded, and must be submitted by August 1. If, as a result of taking summer courses or other issues, submitting final official transcripts by August 1 will not be possible for you, please contact the Admissions Office. The Admissions Office obtains final official university transcripts for McGill students directly from the Registrar’s Office; as such it is not necessary for current McGill students to submit final official transcripts. Please contact the Law Admissions Office by email or telephone (514-398-6602) for any questions related to your offer of admission. Our knowledgeable Admissions Office staff will be happy to help. The fees you pay at McGill are calculated according to whether you are a Quebec resident, Canadian citizen or permanent resident, or an international student. The Mnistère de l’Éducation et de l’Enseignement supérieur (MEES) requires all students to provide proof of status. Note that Canadian citizens and Quebec Residents will be billed as international students until proof of citizenship/residency are submitted and approved by McGill. Relevant forms and detailed information about the required legal documents can be found on Enrolment Services’ Legal Documents website. The Ministère de l'Enseignement Supérieur, Recherche, Science et Technologie (MESRST) requires that all students who are registered in a Quebec University be assigned a “Permanent Code”. Students who have previously attended an educational institution in Quebec have already been assigned a Permanent Code. If you do not have a Permanent Code, the University must collect the appropriate data and documents for submission to the MESRST, so that a Permanent Code can be created for you. If McGill does not have a Permanent Code for you, which can be viewed on Minerva from the Personal Menu, we will require a signed copy of the Permanent Code Data Form. Students who require confirmation of their status at McGill can obtain a letter acknowledging they have accepted enrolment in the BCL/LLB program at the Faculty of Law. Once you have registered for your courses you may obtain this letter by accessing your record in Minerva. For more information see Proof of Enrolment. You may obtain your McGill ID card from Service Point within 24 hours of registering for at least one course. Campus Life & Engagement's Your First Year at McGill site is here to help you acclimatize, settle in, and find the people and services you need. Browse through their site to find all the information you'll need to kick off your time at McGill, from useful pre-arrival checklists and apartment-hunting tips, to basics like finding a cell phone provider, a bank or a grocery store! Each year McGill welcomes 3,000 undergraduates students to their dorms, apartments and shared-facilities houses. Visit the McGill students housing website. The McGill Off Campus Housing Service publishes lists of apartments for rent and to share, as well as rooms for rent in private homes in the vicinity of the downtown campus and close to major bus and metro lines. International students should consult McGill's Office of International Student Services for information about McGill services available to international students, and an overview of immigration processes. Copies of any and all valid immigration documents (e.g. CAQ and Study Permit) must be remitted to McGill, and should be valid for any and all terms in which you are registered. Relevant forms and detailed information about the required legal documents can be found on the Enrolment Services' Legal Documents website. The Native Law Centre (NLC) at the University of Saskatchewan offers a Summer Program that is designed to prepare students for the challenges and rigours of law school and to facilitate a smoother transition into the law school environment. 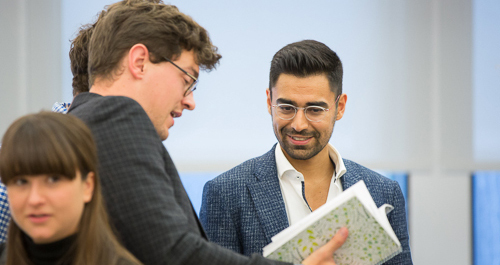 The NLC Summer Program Property Law course studies the Common Law of property and Aboriginal property and as such it is not accepted as a property law credit in the McGill program where our course covers Common Law, Civil Law and Indigenous legal traditions. The NLC Summer Program property law course can however be counted as an elective credit in the McGill program. See Indigenous Applicants for more information. Students who have had academic accommodations during their previous studies are encouraged to contact the Office for Students with Disabilities (OSD) at the time of their acceptance at McGill. If you discover that you require assistance once you are at McGill, you may also contact the OSD at that time. If it is possible that you will require assistance, please contact the OSD before starting in our program. See the Office for Students with Disabilities website for more information. You must register in all your mandatory first year courses (information on when to do that will be in your package). You must attend mandatory in-person registration day and orientation activities. You will find in your Orientation and Registration Package all the necessary information to register in your courses on Minerva. The Law Students Association organizes various orientation activities for new students over the course of the first two weeks of the Fall term. This is the Faculty of Law's own version of Frosh. It's a great way to meet fellow law students. Your Orientation and Registration Package will contain a calendar of activities.